Welcome to this month's Nailstalgia! Today, we'll be checking out OPI- My Private Jet, which is probably one of the most well-known OPI shades! Now, it's pretty documented that there are at least three different versions of this iconic shade floating around. The most sought after is the original version, and is much more holographic than the others: a linear holo, in fact. Here is a good comparison of the three known varieties by The TraceFace Philes. I definitely own one of the "duds," what I believe is colloquially referred to as the "yuk brown" version. So that's what we'll be taking a look at. Although, it's not a dud to me! I think this is a gorgeous shade- understated holo or no! I picked this version up in an Ulta circa 2010, I believe. My Private Jet is a rich, warm brown base (almost a taupe-ish brown?) with fine-milled scattered holographic shimmer particles. You can see that the holo particles are the small flakie variety. This color photographs a little more to the charcoal side than I think it actually is. It is slightly browner in person. It reminds me of granite! I haven't worn this in a few years, and forgot how lovely it is! By the way, the nail stickers are from Sally Beauty, I believe. You can see the holographic effect in the sun. It's not super duper strong (like the original version), but it's definitely there. And, personally, I prefer a scattered holo finish to a linear one anyway. Call me crazy! Formula: The viscosity is on the thin side, but even so I found it very easy to control. It paints over the nail surface easily, but might cuticle drag if you really overwork it. It's mostly forgiving though, and dries down quickly! The second coat goes on so buttery- very nice! Opaque in two coats! 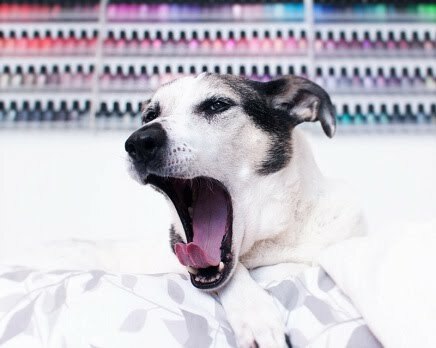 Pssst: Don't forget to check out these other ladies' Nailstalgia posts! Have any of you guys managed to get your paws on the original My Private Jet? Great swatch of this color. Love the little nail art you did too. Its a nice color but not terribly unique to me. I love this polish. I will definitely be breaking this out when I do browns on my blog in November. <3 Beautiful photos as always. This post reminds me that I still need a bottle of this, I can't be the only one out there that prefers the "yuk brown" version! I don't like the original better than this version (which I also have). I don't think its a dud at all! I don't think you are! Haha, I love Winter, but the weather is my nemesis for swatching holos! It is so fun though to wear them and have anice surprise if you do get some sun. :) That Different Dimension looks really gorgeous!